If there is one thing that gets neglected in gyms across the world, I think its Farmer Carries. Everyone seems to want the pretty exercises or the glamour exercises. The ones you can post about on Instagram, or tell your friends about when you all get together and talk about how cool you were in college. But what if I told you there was something that you could do to increase hip strength, grip strength, core strength, upper back strength, work capacity aka cardio aka calories burned aka make those love handles disappear. I’ll give you a hint, it’s not the shake weight. But if you can successfully do all those things with a shake weight I applaud you. Why do I love this exercise, besides the reasons I listed above? It’s simple, it’s easy (to teach), it’s time efficient, it makes your chest and back look jacked while you are performing it. Shoulder Health: Because you are holding two heaving objects and squeezing them as tight as possible, the rotator cuffs are forced to activate. So, when performing a farmer carry, death grip and hold on for life. Improves Posture: Because of all the sitting, cell phone using, and poor moving, we have become a very kyphotic or shoulder rounded society. Carries force you into good posture, and make you automatically straighten that back up and puff that chest out. So now that I know I need to be doing these, when do I do them? Honestly it just depends. Great answer, I know. Before doing them ask yourself what you are going after, what else you are doing that day or that week that could be affected by carries. Carries can be used as a conditioning tool, as a strength tool, as a core exercise, or just something to do on off days to get up and move around. Like many people, I like to perform mine closer to the end of the workout. 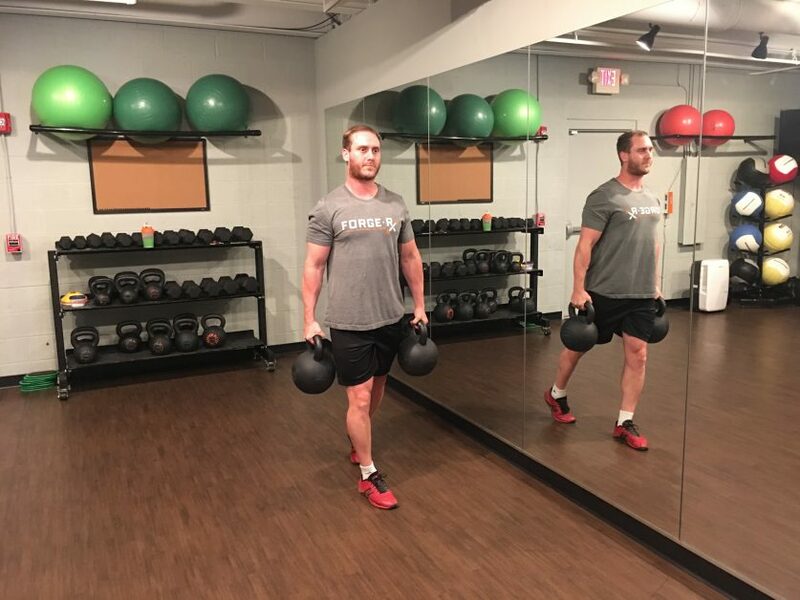 This not only allows you to gas yourself out, but also saves your grip strength for things like deadlifts, chin ups, or rowing variations at the beginning of your workout. If you want to program it more as a strength exercise, I recommend pairing it with another movement that doesn’t tax your body as much, something like a plank or anti rotation press comes to mind. If you need work in the mobility department this would be a good time to throw in a mobility drill between sets. We have lost the art of getting stronger in the simplest way, picking things up and carrying them from point A to point B. Is there a more functional exercise then this? In my opinion no. Its functional and it can make us look good, where I come from that’s what we call a win-win situation.